Drew Angerer/Getty ImagesOmarosa Manigault Newman in the White House briefing room. 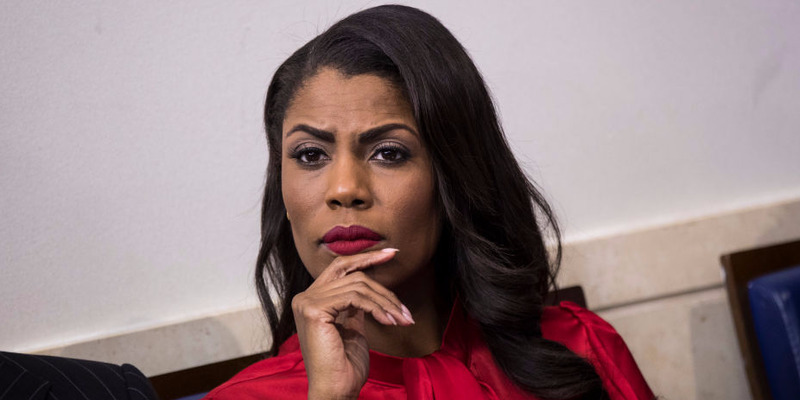 After Omarosa Manigault Newman was told on Tuesday of her firing from her White House position, she attempted to enter the White House residence, according to April Ryan of American Urban Radio Networks. Newman, who is said to be close to President Donald Trump but disliked by others in the White House, was escorted from the White House grounds, Ryan said. The former reality-TV star reportedly protested her dismissal and used vulgar language with the White House chief of staff, John Kelly. After the White House chief of staff, John Kelly, on Tuesday informed Omarosa Manigault Newman of her firing, she attempted to enter the White House residence to speak with President Donald Trump, only to be escorted from the grounds. That’s according to a Wednesday report from April Ryan, American Urban Radio Networks’ White House correspondent. Ryan said Newman, a former Trump campaign adviser who has since January been the director of communications for the White House’s Office of Public Liaison, protested her dismissal and brought up her efforts to recruit black voters to support Trump during the campaign and her relationships with historically black colleges and universities. Kelly also told Newman, one of the president’s best-known black supporters, that Johnathan Holifield, the newly appointed head of the White House Initiative on HBCUs, didn’t like her, Ryan said. Ryan said Newman, who competed on Trump’s reality-TV show “The Apprentice” in the mid-2000s, then told Kelly she wanted to speak with the president about her firing. But Kelly responded that Trump had already been informed and signed off on it, Ryan reported. The Secret Service tweeted on Wednesday evening that it deactivated Newman’s pass, which grants access to the White House facilities, but was not otherwise involved in her termination or escorting her off of the premises. Newman’s assistant was also let go, Ryan said. Newman’s role has recently come under scrutiny in the media, with reports suggesting her position is vague and undefined and a point of frustration for her colleagues. She has struggled to develop relationships between the Trump administration and black lawmakers and communities, and she has a history of sparking workplace drama. And Newman is reportedly disliked by many in the Trump administration, including Kelly and Jared Kushner, Trump’s son-in-law and senior adviser. In a Wednesday statement, the White House press secretary, Sarah Huckabee Sanders, said that Newman resigned on Tuesday “to pursue other opportunities” and that her official last day would be January 20. This is not the first time Newman has been dismissed from a White House position. The Howard University graduate, who served under President Bill Clinton and Vice President Al Gore when she was in her early 20s, was fired from her job in the Clinton administration’s Commerce Department. It was originally reported that Newman was escorted off of the White House premises, but the Secret Service disputes this.